Frothy Monkey has a group membership to the Arts & Business Council which allows any of our employees to attend their monthly seminars at the discounted members-rate. 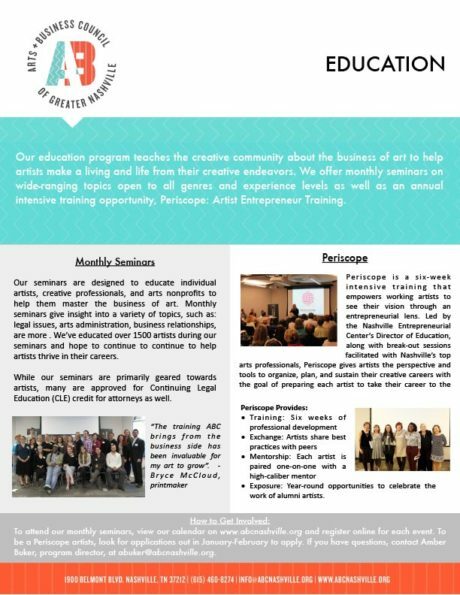 The Arts & Business Council’s education program teaches the creative community about the business of art to help artists make a living and a life from their creative endeavors. They offer monthly seminars on wide-ranging topics open to all genres and experience levels. You can see their upcoming programs at: www.abcnashville.org/education. Employees should email jenn@frothymonkey.com for more information and to take advantage of benefits.